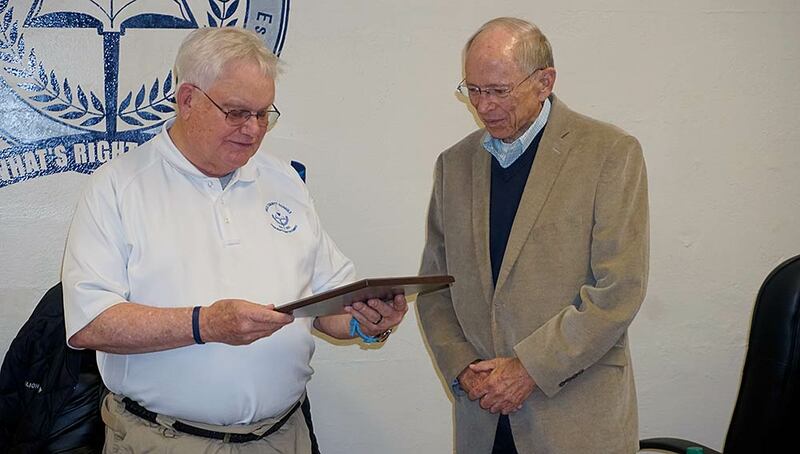 Polk County Schools celebrated the career of Jim Patterson as the veteran educator attended his final meeting of the Polk County Board of Education. After a distinguished career in education, including time spent with Polk County Schools, Patterson joined the Polk County Board of Education in 2014, representing Tryon Township. He decided not to seek re-election this year, with the November board meeting marking his final session. Michael Ashworth ran unopposed for Patterson’s seat and will be sworn in at the board’s December meeting to begin his term. Prior to the board’s November meeting, colleagues and friends from throughout the county gathered at Stearns Education Center to salute Patterson. During the meeting, Polk County Schools Superintendent Aaron Greene and board chairman Geoffrey M. Tennant each spoke about Patterson before presenting him with a plaque in honor of his board service. Geoffrey M. Tennant, chairman of the Polk County Board of Educations, reads from a plaque presented to Jim Patterson for his service to the board. I have known and worked with Jim Patterson for almost two decades, far too long for anyone to have to put up with me. I can tell you that Jim has been a significant part of my life since my time as a high school principal. A great mentor and friend, Jim helped me navigate many tricky situations and provided support, clarity, objectivity and reason when I needed them most. I feel very fortunate to have known and worked with Jim Patterson for so many years. Jim has always been more than a personnel director or a school board member. He has been a dedicated educator, and a student and employee advocate for many many years. Jim’s leadership, dedication and interpersonal competence is rare and extremely impactful. I still hear stories about him taking extra time to support an employee during a trying time, giving additional consideration and support to help a student in a tough situation, or having the fortitude to make the tough decisions when they were necessary. He thinks carefully about issues, works hard to consider the viewpoints of others and understands the importance of our work. Jim already had a long list of accolades and a commendable service record from his prior district in Gaffney, and he continued changing lives for the better when he joined us. Jim Patterson has been a vital part of our organization since his arrival, and I know all of Polk County Schools appreciates his work and commitment to our students and schools. As a board member, Jim never stopped his belief in listening to others or practice of weighing all the facts. He brought a great deal of perspective and expertise to our board, and I know his presence and contributions will be missed. Although he does know where many of the bodies are buried, Jim always made sure to communicate why he was asking questions or the basis for why he might disagree. But Jim was never disagreeable. In this day and age of fighting first and seeking to understand later, Jim’s careful and respectful approach to leadership and governance is refreshing. I would argue it is hugely important to model and practice as we encounter more difficult times and issues. I know I speak for the entire board when I say thank you for your time, effort and your wisdom.